IMARI actually refers to the port of Imari in Japan, from where Japanese Porcelain chinaware from the nearby city of ARITA were shipped to mostly European destinations since early 18thC. For this reason, Imari now stands for a distinct decorative style developed and perfected by several companies & potteries or artisans in this region in the form of Decorative & Art Porcelain or Earthenware. The Imari decorative style originally consisted mainly of symmetric geometric panels with elegant repeating or slightly varied patterns of floral motifs and was characterized by a very specific combination of colors, primarily strong greens, and dark reds, most often underglaze, and called ARITA WARE. As this style became more popular, especially in Western markets, dark blue and bright gold coloring was added to the mix and has remained the most dominant variation since then. This newer style is also referred to as KINRANDE by serious collectors to distinguish it from the older patterns. Needless to say, as porcelain manufacturing became more established in Europe, the Imari style and patterns were extensively imitated and almost blatantly copied by several companies in the UK, Germany, Holland, and France. The KAKIEMON style is similar to IMARI, but with more white spaces and thinly decorated surfaces. Original Arita & Imari kilns date as early as 1610s, established by mostly Korean potters brought in to help in developing the local Ceramics industry and used local high-quality white clay. Their efforts flourished around 80 to 100 years later and local potteries became extremely versed in the art of porcelain, producing remarkably beautiful and sturdy items. It is said that the original influences on the Imari style were from Dutch traders, who requested that Arita potters use familiar patterns and designs found on local textiles that seemed exotic and more appealing at the time to European buyers. These authentic early 18thC Imari patterns, now found in Museums and very fine private collections, were somewhat "busy" and had no gold overtones or overglaze gilding. However, the vast majority of items found in the market today with an ARITA or IMARI label or in that style date ca mid-19thC onwards and may originate from many countries other than Japan. Chinese porcelain makers also imitated and soon adopted this style and begun making CHINESE IMARI in slight variations, mainly in the selection of colors and some of the floral designs. 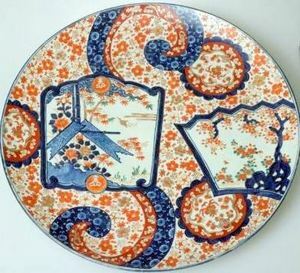 LARGE JAPANESE IMARI CHARGER 18 INCHES Stamped under glaze. Japanese Imari Porcelain Oval Bowl, circa 1890. 6 Pcs. Japanese Imari Porcelain, bowls & chargers.